The Thomas G. Moss campus of Tidewater Community College (TCC) was initiated by members of HL Development as a means to revitalize the downtown Granby Street corridor. Previously vacant and deteriorating, the Martin Building, the Loews Theatre Building, the F.W. Woolworth building were all restored to provide necessary classrooms, laboratories and office space for the students and faculty of T.C.C. The Martin Building houses the library and administrative offices for the College. The F.W. Woolworth Building houses classroom and laboratory spaces. The Loews Theatre renovation provided computer laboratories and the renovated award winning John Roper Performing Center is the home to various community theatre and performing groups. The Mason D. Andrews Science Building was a new building and constructed as an urban infill building on Granby Street and is approximately 50,000 s.f. of needed laboratory and classroom space. The main buildings are constructed around public squares that provide not only open space in the campus setting, but also are urban parks within the downtown provided necessary green space for new residents living and working at TCC as well as Downtown. The introduction of thousands of students into the downtown corridor has energized and created an entire section of the city with new residential, retail, and service related commercial catering to the needs of students and faculty. 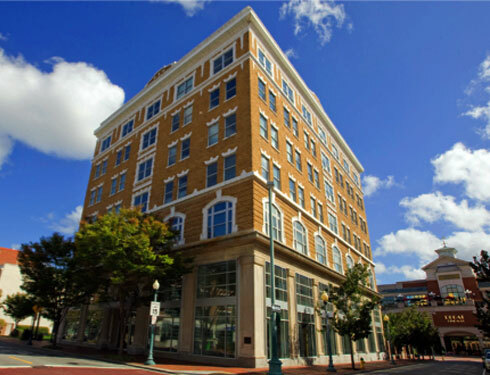 HL Developments goal is to provide opportunities for urban revitalization by mixing in new uses into the urban form and utilizing existing historic buildings and bringing them to new life, and we have accomplished that with the TCC Campus in Downtown Norfolk.